DolciDeleria: How is it the End of May? Sure, I know I've been busy, but gee whiz already, surely Father Time could slow down a little bit? 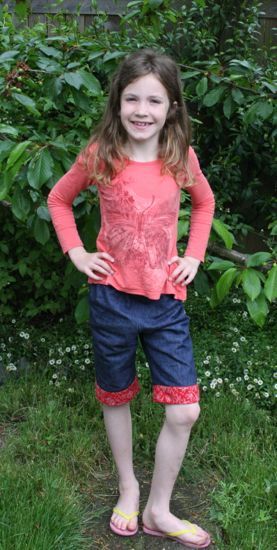 Well after KCW wrapped up, I finished this pair of shorts for Caitlyn. I used up some stashed denim of unknown vintage and a fat quarter in red, so it's definitely stashbusting even if I'm not on theme for May. I used the pants portion of McCall's 6389, changing the waistband, shortening them up and adding the cuff detail. No pockets, though, which I might regret if Caitlyn keeps collecting rocks when she wears these. Guess who gets to carry the rocks home? I love this red fabric. I think it came in a fat quarter bundle I received for Christmas about, oh, something like 10 years ago (thanks, Mom!). It's always made me think of bandanas, even though it doesn't really look like one. This was a perfect use for it. 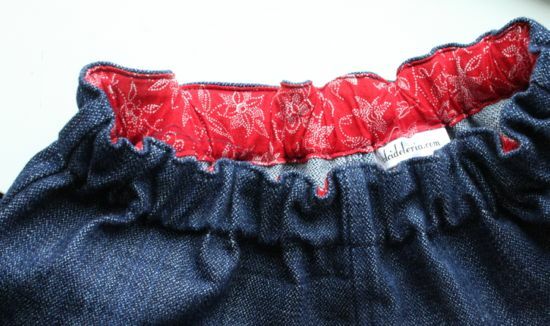 I used the same red for the inner waistband. 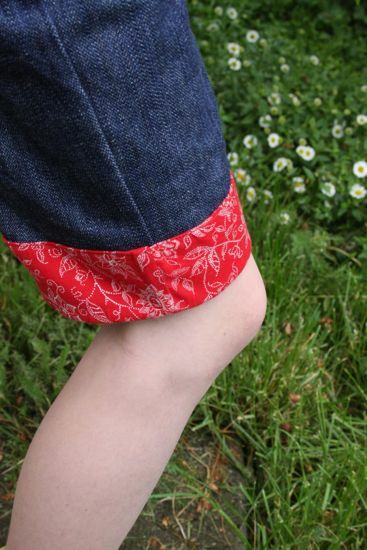 The pattern wants you to just fold over the top of the shorts to make your waistband casing, but the idea of doing that with denim seemed unpleasant. It'd make for a thick, stiff, hard to gather, probably uncomfortable-to-wear waistband. I trimmed off the top of the pattern 5/8in shy of the fold line, added the red fabric for the casing, and did a lot of topstitching. I'm pretty pleased with the result, if I may say so. Caitlyn likes them, too, despite the lack of pockets. She's seriously into tree climbing these days, preferring to terrorize all the adults she knows by climbing as high as possible and then staying there. As an added bonus, she likes to teach other kids how to climb her favorite tree, so yes, that's my kid who's teaching your kid how to give you a heart attack. Pants and shorts are the preferred tree-climber's wardrobe. I'm going to need to get more familiar with pants-making, I think. 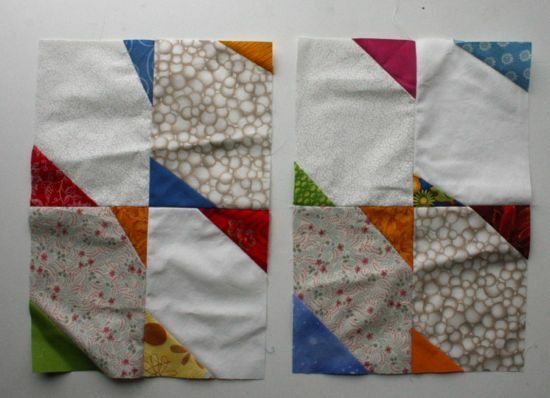 On a unrelated note, I did manage to finish my blocks for Sew.Quilt.Give. this month. Barely. We did farfalle blocks from Film in the Fridge's tutorial. I'm seriously behind on working on March's quilt for the bee and am feeling somewhat envious of the just-sew-the-received-blocks-together assembly that's going to go with this quilt. Notes for next time I'm queen bee: Keep it Simple!